Anglophone Print Culture in Semi-Colonial Shanghai. New Brunswick, NJ: Rutgers University Press, 2009. 204 pp. The culture of early twentieth-century Shanghai has been extensively studied over the past two decades. The majority of these studies has examined Chinese-language sources to map the city’s unique modern urban culture that is comprised of (semi-)colonial, international, and Chinese (or national) influences. Other studies have examined English-language sources to foreground a different aspect of the city’s international culture, namely the life and work of the city’s expatriates or so-called “Shanghailanders.” This has created, it seems to me, a gap in the Shanghai scholarship, between the native and foreign versions of the city’s international culture. Shuang Shen’s new book potentially fills this gap by drawing our attention to English-language sources produced by Chinese intellectuals who had been trained in the West and returned to Shanghai. As far as I know, little or no scholarly attention has been paid to these materials in extant studies of modern Shanghai. The book is comprised of an introduction, four chapters, a glossary, and a bibliography. The Introduction begins with the question “Can English be regarded as a Chinese language?”–which is raised to challenge the dominance of the “national language” paradigm in Chinese or Asian studies. The Anglophone materials discussed in the book indeed call into question the dividing line between Chinese studies and Asian Diaspora Studies. For Shen, these materials embody a cosmopolitanism that is distinct from Chinese nationalism and that has been a hot topic in Asian studies. 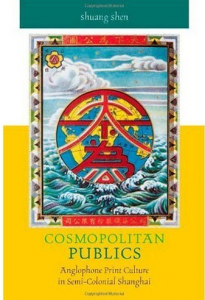 Shen distinguishes this cosmopolitanism from “Western cosmopolitanism” and defines it as uniquely Chinese despite the fact that it is manifested via the English language; it was at once both Chinese and international or, in Shen’s words, “translational and transnational.” To illustrate this Chinese cosmopolitanism’s deployment of English and translational practices, Shen examines two key “cosmopolitan” (and nationalist) periodicals in the first two chapters of the book and a range of other periodicals–most of which are leftist–in the third and fourth chapters. The China Critic, a weekly newspaper published in English from 1928 to 1945, was connected to the Nanking government. It was filled with anti-imperial narratives that are similar to contemporary nationalist discourses in the native language. Yet rather than simply promoting liberal values, the weekly negotiated with the colonial powers for a coexistence of national and international interests. Shen argues that The China Critic exemplifies the cosmopolitan public because the very word “cosmopolitan” was used in the weekly and the editors and contributors promoted a range of transnational and translational ideas (pp. 33-35). Other important concepts, such as hybridity, were also highlighted in the weekly to characterize disjunction and unevenness in Shanghai’s multinational space with its profusion of “borders.” This urban environment facilitated or necessitated “interlingual” activities. In analyzing materials from the weekly, Shen frames political arguments in linguistic or translational terms, drawing on Lydia Liu’s idea of “translingual” modernity. An English-language literary monthly published from 1935 to 1941, Shen considers T’ien Hsia to be at the intersection of cosmopolitanism and nationalism and to have presented “national allegories” to the world. She illustrates this by recapping the “itinerant career” of the magazine’s contributor Jack Chen, whose writing and translation crossed borders between East and West, left and right, and folk and global. This wartime publication also reflected the tension between city and country, or Shanghai and Yan’an, which are interpreted by Shen as representing the cosmopolitan and the local, respectively. Shen pays particular attention to how the magazine’s regular cultural reports–known as “chronicles”–produced a different type of “national time” marked with disjunction between localities rather than unity and abstraction, and how the translations of a great range of Chinese literature from diverse “temporal zones” (i.e., both pre-modern and modern) published in the magazine produced “new temporalities.” Shen argues that the magazine promoted translational time as opposed to national time, and this potentially contributed to the development of literary historical trends that focus primarily on works in the native language. The third chapter discusses the English translations of Chinese literature in leftist publications. Shen applies Walter Benjamin’s theory of translation as the making of history to the translation of Lu Xun’s short stories and political essays into English and Japanese. This translation process, she avers, was creative rather than passive. Shen argues that Chinese to English literary translation was important for cosmopolitan reasons prior to the establishment of a hegemonic nationalist literary tradition (in the native language). Shen also critiques Edgar Snow’s characterization of a homogenous China for neglecting the complex and ambivalent nature of Chinese nationalism being constructed through translation during this period. This is an interesting approach to the history of modern Chinese literature, which Shen shows to have embodied a greater degree of “internationalism” than is usually assumed. Throughout the book, Shen uses the term “translation” (or translational) to broadly refer to the processes of cultural assimilation and hybridization. She argues that translation played an important role in cultural (re)production before the notion of a hegemonic national language had been consolidated, and that the latter was influenced by the use (or translation) of English. This illustrates the complex formation of (the discourse of) Chinese nationalism and national identity as constructed through print culture. Although Shen calls our attention to the impact of linguistic or literary production on broader social, cultural, and political processes, precise connections between discursive production and larger cultural processes are not clearly evident. Shen’s liberal use of the term translation at times makes her arguments unclear and abstract. In fact, Shen uses a great range of terms interchangeably in the book, among them: transcultural, translocal, and transnational; translational, translingual, and interlingual; nationalism and stateism. The precise meanings of and subtle differences between these terms are not always clear. A more prudent and meticulous treatment of these terms would have augmented the focus on translation and linguistic effects. Furthermore, while Shen’s textual analyses of the Anglophone periodicals make many references to the current scholarship on and discourse of cosmopolitanism, nationalism, and translingual modernity, the book would have been strengthened by an empirical study of the periodicals’ funding, production, circulation, and readership. For example, Shen considers these periodicals to have served a Chinese readership without presenting sufficient historical evidence to support this claim; by my count, the issue of readership is only mentioned once in passing (p. 51), and the term is not even listed in the book’s index. The book could also have engaged more of the recent scholarship on the social and cultural history of modern Shanghai. Such engagement would have provided a better historical background for Anglophone print culture and shown how influential it was beyond a limited circle of elite intellectuals in early twentieth-century Shanghai.